This house is the epitome of comfort. Each room has new mattresses, bed frames and linens. The Sofa's, blankets and chairs were all purchased with one thing in mind, comfort. The Dining table seats 8 and is adjoining to the kitchen and living space for an open concept. 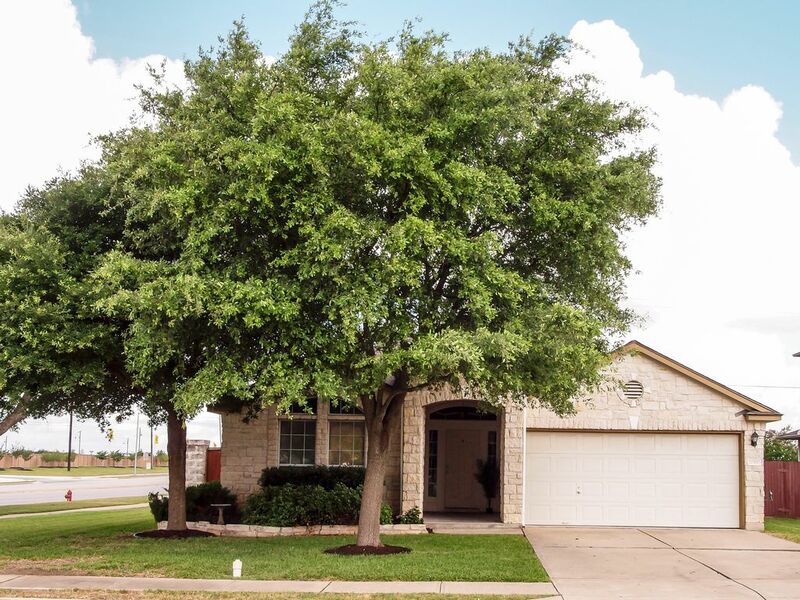 The house is easily accessible of the freeway and close to the heart of Round Rock. A grocery store is within walking distance and Target less than 1 mile away. Lastly, the yard is private and the BBQ ready for your use. High on my list is cleanliness and this house was spotless. We really appreciated that. Also, the beds were very comfy! It's in a good location for accessing Austin, Round Rock and Georgetown. The owner had some "extras" there for us- which we appreciated very much. Things like bottled water, condiments, shampoo and lotions. Only a few negatives. First one: there is a garage, but no remotes. So that means you have to get in & out of the car to go into the house to push the door opener- a pain for us since our health makes that a not so easy process. We ended up just leaving the door open, but that is a safety issue. Second: There is a major development going in right behind the house- I mean RIGHT behind this property. They start early in the morning and the noise might bother some- we didn't mind it that much, but the dust made it unpleasant to spend any time on the back porch. This is a big development, but they are moving along fast, so hopefully it won't be an issue for much more than a year. Lovely home, centrally located. Every convenience, large comfortable rooms, clean home. My only complaint is the construction which began at 7 am outside the master bath, but this is beyond the homeowners control obviously, just would have been nice to know about ahead of time. The noise wasn't really too bad and didn't bother any of us in any appreciable way. A 5 star home for certain. Very nice place to stay - very clean, comfortable and felt like "home away from home." Easy to get around and nice quiet neighborhood - was perfect for our party of six. Comfy beds, plenty of room and everything we needed. Would highly recommend. We had a wonderful relaxing week at this property. Great house and location. House is great. Location perfect. Owners very responsive and price quite reasonable. The property was very nice. The neighborhood was great for taking walks. Close to grocery store. Nicely furnished. Very comfortable beds.